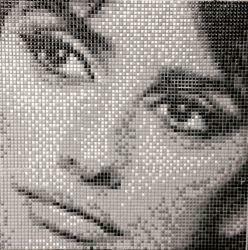 We are premium manufacturer of stylish Mariline Monore Portrait in Glass Mosaic Tile , fabricated using high quality material procured from our reliable vendors. These tiles are available at reasonable rates to our reliable customers. We also offer personalized services to our clients at competitive prices. Being an industry leader we provide a assortment of Aishwarya Portrait in glass Mosaic tile to our precious clients. These are appreciated for intricate work, innovative designs and widely demanded in international market. Our range is available in numerous designs, colors, shapes and sizes to suit the requirements of clients. 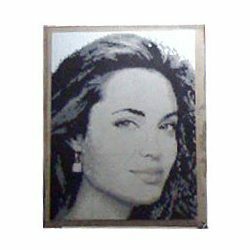 We meet the artistic tastes of our clients by offering special variety of Angelina Jolie Portrait in Glass Mosaic Tile. Designed by our In house designers, Crafted by our skilled craftsmen. Considered to precision, these black & white tiles are known for their skin texture like resistance to chemicals, anti-skid etc. These tiles are highly demanded in international market at affordable prices. 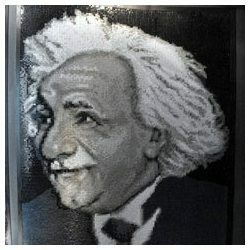 We bring a broad variety of Albert Einstein Portrait in Glass Mosaic Tile, which are in extensive demand to improve the look of homes. With our technological expertise we manufacture face design tiles which are aesthetic in design. We offer these tiles in different shapes and sizes, as per the requirement of the clients. We offer customization as per their specifications of our clients at reasonable prices. We are also engaged in manufacturing of Family Picture in Glasss Mosaic Tile. We polish these face design tiles using premium quality material. This gives our customers an opportunity to choose from the available range as per their preference and requirement. The sleek look that we give to the tiles through fine polishing enhances its beauty proportion. These tiles can also be customizing as per the specifications of our clients at customer friendly prices. Looking for Portrait Mosaic Tiles ?